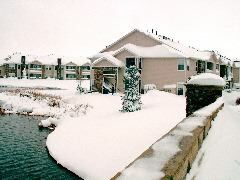 The Eastern half of Colorado got hammered by a blizzard on the 18th and 19th of March, 2003. 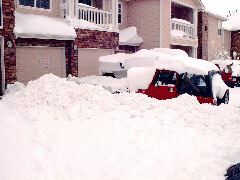 The area where Kim and I live received approximately 36 inches of snow. 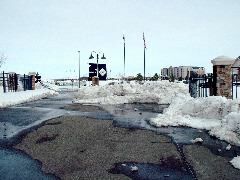 The record snowfall brought most of the state to a standstill for three days, while snow removal crews struggled to clear blocked streets and highway's. 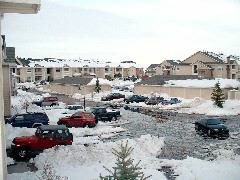 Here's a few photo's from around the apartment complex where we live. My back hurts from just looking at them. 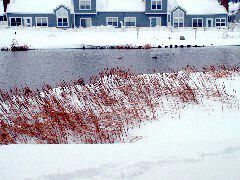 The blizzard shut down interstate highways, schools, businesses, the airport, everything. Even Buckley AFB was shut down. I ended up staying home from work for two days. Unfortunately, I had to make up for it on the weekend. 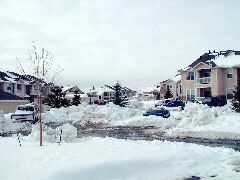 Many roofs collapsed, there were some minor power outages, and I shoveled a lot of snow. Reminded me of Misawa.